Everyday our lives are being impacted by more and more data. We have become a data driven society. In business and industry we are using data in more ways than ever before. Today manufacturing companies gather massive amounts of information through measurement and inspection. When this measurement data is being used to make decisions regarding the process and the business in general it is vital that the data is accurate. If there are errors in our measurement system we will be making decisions based on incorrect data. We could be making incorrect decisions or producing non-conforming parts. A properly planned and executed Measurement System Analysis (MSA) can help build a strong foundation for any data based decision making process. MSA is defined as an experimental and mathematical method of determining the amount of variation that exists within a measurement process. Variation in the measurement process can directly contribute to our overall process variability. MSA is used to certify the measurement system for use by evaluating the system’s accuracy, precision and stability. Personnel – the operators, their skill level, training, etc. Items to be measured – the part or material samples measured, the sampling plan, etc. Environmental factors – temperature, humidity, etc. All of these possible sources of variation should be considered during Measurement System Analysis. Evaluation of a measurement system should include the use of specific quality tools to identify the most likely source of variation. Most MSA activities examine two primary sources of variation, the parts and the measurement of those parts. The sum of these two values represents the total variation in a measurement system. An effective MSA process can help assure that the data being collected is accurate and the system of collecting the data is appropriate to the process. Good reliable data can prevent wasted time, labor and scrap in a manufacturing process. A major manufacturing company began receiving calls from several of their customers reporting non-compliant materials received at their facilities sites. The parts were not properly snapping together to form an even surface or would not lock in place. The process was audited and found that the parts were being produced out of spec. The operator was following the inspection plan and using the assigned gages for the inspection. The problem was that the gage did not have adequate resolution to detect the non-conforming parts. An ineffective measurement system can allow bad parts to be accepted and good parts to be rejected, resulting in dissatisfied customers and excessive scrap. MSA could have prevented the problem and assured that accurate useful data was being collected. MSA is a collection of experiments and analysis performed to evaluate a measurement system’s capability, performance and amount of uncertainty regarding the values measured. We should review the measurement data being collected, the methods and tools used to collect and record the data. Our goal is to quantify the effectiveness of the measurement system, analyze the variation in the data and determine its likely source. We need to evaluate the quality of the data being collected in regards to location and width variation. Data collected should be evaluated for bias, stability and linearity. During an MSA activity, the amount of measurement uncertainty must be evaluated for each type of gage or measurement tool defined within the process Control Plans. Each tool should have the correct level of discrimination and resolution to obtain useful data. The process, the tools being used (gages, fixtures, instruments, etc.) and the operators are evaluated for proper definition, accuracy, precision, repeatability and reproducibility. Prior to analyzing the data and or the gages, tools or fixtures we must determine the type of data being collected. The data could be attribute data or variable data. Attribute data is classified into specific values where variable or continuous data can have an infinite number of values. More detailed definitions can be found below. To perform a study, you should first obtain a sample and establish the reference value compared to a traceable standard. Some processes will already have “master samples” established for the high and low end of the expected measurement specification. When interpreting the results of a Gage R & R, perform a comparison study of the repeatability and reproducibility values. If the repeatability value is large in comparison to the reproducibility value, it would indicate a possible issue with the gage used for the study. The gage may need to be replaced or re-calibrated. Adversely, if the reproducibility value is large in comparison with the repeatability value, it would indicate the variation is operator related. The operator may need additional training on the proper use of the gage or a fixture may be required to assist the operator in using the gage. Next, calculate the kappa value. The attribute gage study should be performed based on the same criteria listed previously for the Gage R & R study. 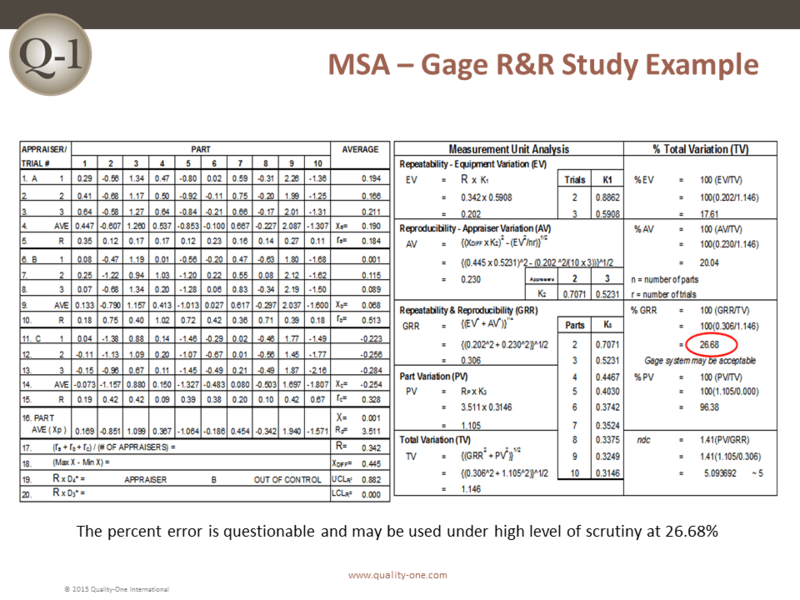 During MSA, the Gage R&R or the attribute gage study should be completed on each of the gages, instruments or fixtures used in the measurement system. The results should be documented and stored in a database for future reference. It may be required for a PPAP submission to the customer. Furthermore, if any issues should arise, a new study can be performed on the gage and the results compared to the previous data to determine if a change has occurred. A properly performed MSA can have a dramatic influence on the quality of data being collected and product quality. Quality-One offers Quality and Reliability Support for Product and Process Development through Consulting, Training and Project Support. Quality-One provides Knowledge, Guidance and Direction in Quality and Reliability activities, tailored to your unique wants, needs and desires. Let us help you Discover the Value of MSA Consulting, MSA Training or MSA Project Support.